BEIJING -- Putting a bright face on the future of U.S. ties with China, President Obama announced Monday that the two countries would start granting visas to each other's citizens valid for up to 10 years. Yet thorny issues like human rights and trade lurked just under the surface, reflecting the tough road ahead for the two economic powers as Mr. Obama began a weeklong trip to the region. 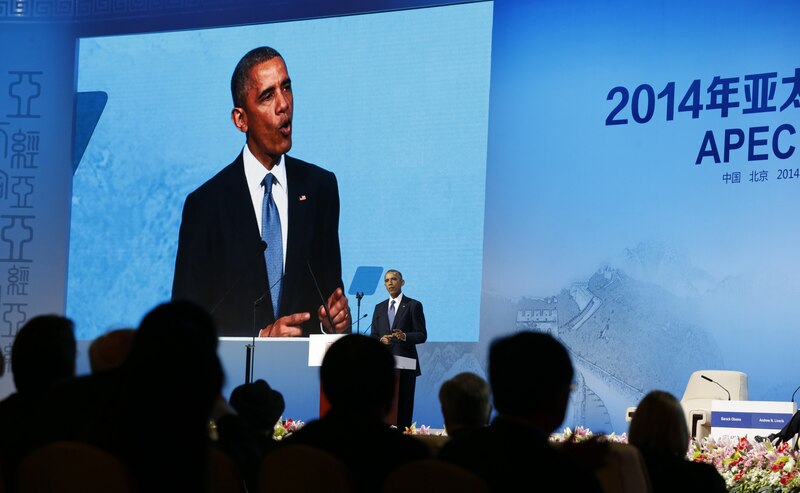 Mr. Obama, addressing Asian business leaders at a high-level summit, sought to dispel the notion that America's interest in Asia should be a cause of concern for China's leaders. Beijing has viewed Mr. Obama's engagement here with trepidation out of concern the U.S. wants to limit China's rise, but Mr. Obama insisted that "one country's prosperity doesn't have to come at the expense of the other." "We want China to do well," Mr. Obama said. "We compete for business, but we also seek to cooperate on a broad range of challenges and shared opportunities." Under the visa agreement, U.S. and Chinese citizens will be able to obtain business and short-term tourist visas valid for 10 years, up from one year currently. Student and cultural exchange visas will be made valid for five years rather than just one year, Mr. Obama said. Coming just hours after Mr. Obama's arrival in Beijing, the announcement offered the president an opportunity to portray and the U.S. and China as working in good faith toward closer ties. "America's a Pacific power, and we are leading to promote shared security and shared economic growth in this century just as we did in the last," Mr. Obama said at the Asia-Pacific Economic Cooperation summit in Beijing, the first stop on Mr. Obama's weeklong trip to China, Myanmar and Australia. Yet the visa agreement may have only modest implications. It doesn't increase how long an American can remain in China or vice-versa. Rather, it increases the length of time during which a visitor is permitted to enter the country. So a Chinese citizen who visits the U.S. every few years would be able to use the same visa for a decade, rather than having to reapply for a new visa every year. At the same time, other signs pointed to a heightened sense of competition that have rankled relations between the world's two largest economies. Only hours earlier, Mr. Obama was at the U.S. Embassy hosting heads of state from the 11 other countries - excluding China - that are pursuing a long-delayed trade pact. Finalizing the Trans-Pacific Partnership is a cornerstone of Mr. Obama's much-touted effort to expand U.S. influence and economic presence in Asia, but China has responded by pushing its own regional trade deal with many of the same nations. The U.S. plans to start issuing the new visas Wednesday. Officials said the agreement had been in the works for months ahead of Mr. Obama's visit. The U.S. said it hoped the deal would lure more Chinese travelers to the U.S. - and with it, billions of dollars into the U.S. economy. The White House said it could drive up demand that would create hundreds of thousands of jobs in the U.S., without sacrificing national security. About 100 million Chinese traveled last year, but less than 2 percent of those came to the U.S.
U.S. officials said Mr. Obama would have further agreements with China to announce later during his three-day visit when he meets with President Xi Jinping, and the two leaders have common cause when it comes to combating climate change. But thornier issues were also on the agenda for Mr. Obama's meetings in China, including cybersecurity and China's aggressive posture toward its neighbors. The extension of some visas for Chinese nationals to 10 years matches what's allowed for citizens of nations with close relations with the U.S., such as European countries and Brazil, the Reuters news agency notes. A senior U.S. official told Reuters the White House sees the visa accord "as a really big win," with the potential to add 440,000 U.S. jobs by 2021 and inject $85 billion a year into the U.S. economy. Another U.S. official told the news agency more contact between Americans and Chinese would "get to some of the core sources of distrust and competition at the heart of the U.S.-China relationship."